2017 Indiana Woodgas Meetup | Argos, IN | May 11-14 - Events - Drive On Wood! Dolittle had a great time too. He loves the food and fun. Dolittle is a HE ? OK then, sorry buddy. Here is a link to the next Argos meet-up video. Thanks you much for the video !! Sure wish I could have been there. Hey now, you’d better take a bunch of videos and pictures! We’re counting on you! Hope you have a great time, report lot like others sayd! 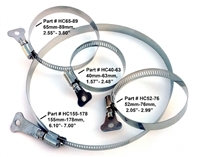 Here is the link to the thumb tighten hose clamps you may have seen at Argos. Here is another (long) video. It is mostly fly-on-the-wall footage of Larry and Billy working on a scrap and hardware store gasifier in order to try Larry’s new gasifier nozzle concept. Just about everyone who came by had something to contribute! update: that gasifier worked well and produced great gas as you can see. We shut it down that evening and let it smother itself out. I hauled it home to Alabama the next day without opening it. I was a little concerned that 70 mph would reignite some char but it was fine. I don’t remember that date, but 2 days ago we opened it up again to prep it for a demo yesterday during a class. We found out then that it had been making its own char, but it had made a little tar. Most of the tar was concentrated on the venturi/asperator that Larry came up with at the top suggesting that his recirculation idea was in fact working. The tars were condensing on the “cold” inlet air pipes. That was encouraging. It may be that he has come up with a way to deal with tars more efficiently and actually be able to use more of them as fuel rather than running them off into a collection tank=energy in the wood that is not being used=more miles per pound and less need for space for the unit. We need to do a lot more testing. I am looking for an older junker engine to test with. After opening it up we found some condensation----water—in the bottom of the barrel. Obviously we need a way to drain condensate. Also, we suspected from the start that we were using fuel much too large for that size unit. When we emptied the unit to prep for our class, Jakob cut the pieces that had been used in that video into approx 1 x 1 inch cubes. Much of the chunks were charcoal at varying stages of carbonization. We loaded the unit with char that was left from the initial experiment-----thanks Don Mann------to just about 1/2 inch above the nozzle opening. Then we put the most charred pieces of wood on top of that, then some new Alabama oak cubes from the cabinet shop. (not sure if the fact that the unit was made from an Indiana junk pile made it prefer Indiana oak to Alabama oak or not) In any case, the unit functioned quite well and made good gas for the class demonstration. I have yet to attach it to an engine. I want to come up with a filter system and also try to determine how much tar we are actually passing into the “effluent” before I risk one of my engines. We did have a great deal of water in the gas it seemed and I am not sure what that is all about. It was different from the burn in IN. I think it had to do with the fact that we started with much less charcoal and were trying to make char for gas production much earlier in the burn than before. We should have started with more char. Because of time restraints we didn’t seem to get it to operating temp before the flaring demo like we did in IN. Here’s a link to a Google Pictures site where you can get some ics from Argos. I think there are 92 pics. Some might be from here at home since Argos. I will try to post some of my favorites directly on here. Can’t get in… you need to fix the permissions. Click “share” and “anyone with the link”. EDIT: Good job, it works now. I guess for the Google link you’ll have to send me your email and a share request so I can add you to my contacts.